Last Wednesday night was one of the highlights of my summer. 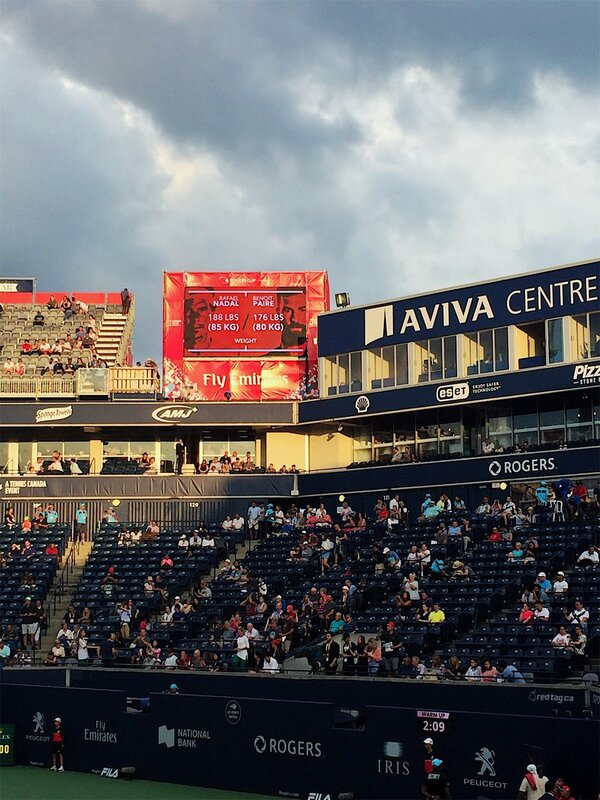 I attended the Rogers Cup which was held here in Toronto at York University’s Aviva Centre. That night Rafael Nadal played his first match against French tennis player Benoit Paire. 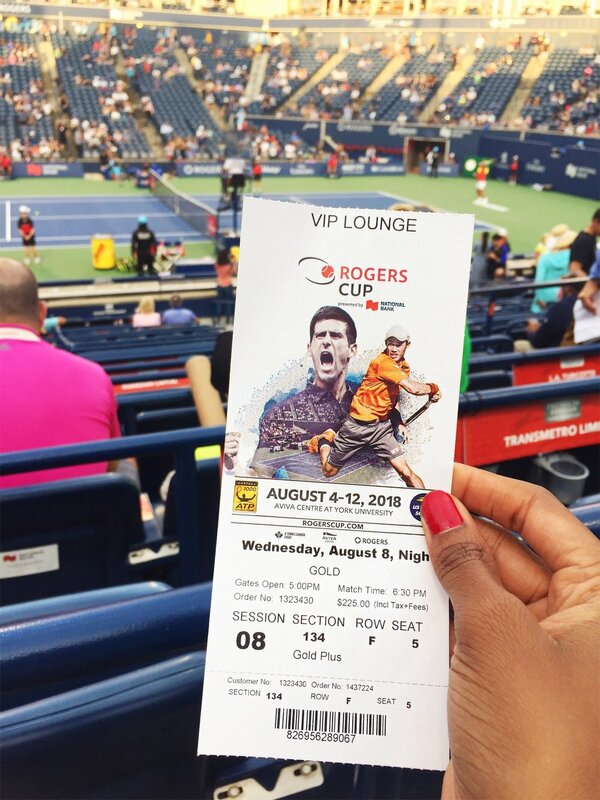 This was my first time attending a tennis match at a big tournament like the Rogers Cup. As I mentioned in my previous post, I’ve recently fallen in love with the sport and so when I saw the tournament being advertised on the TTC (Toronto Transit Commission) trains and around town, I knew I had to go. Although I wasn’t as enthusiastic about tennis before, I have always casually watched tennis matches and I’ve always been a fan of Rafael Nadal. I really wanted the chance to see him play live, so I bought a ticket. The day when it arrived in my mailbox I was ecstatic. When the day came to go and see Rafa play live, I was worried. Worried because the night before it had rained heavily in Toronto and there was lots of flooding. When I woke up Wednesday morning it was raining, and I heard a bit of thunder. Thankfully the rain subsided but it was grey and cloudy all day. I kept an eye on all the matches that day through the official Rogers Cup app. At some point, a few of the matches in the afternoon were suspended. I was really nervous about that but thankfully the matches continued. I rode the TTC to get to the Aviva centre but at one point I had to get off and catch a shuttle bus because a number of the train stations were flooded from the night before. As I was on the shuttle bus, it began to drizzle. Thankfully, it stopped just as we arrived at a train station that wasn’t flooded. I caught the train and rode it until I arrived at Pioneer Village Station- about a ten-minute walk to the Aviva Centre. The sun came out as I was walking, with several other tennis enthusiasts, to the Aviva Centre. I went through security and took a photo with the Rogers Cup sign. Thank you to the kind gentleman who took the photo for me 😃 Thereafter I went to look at the giant screen to watch some of the current matches. Rafa’s match was delayed due to the earlier games being suspended so I walked around a bit and then made my way to the VIP lounge. The ticket I bought gave me access. I enjoyed the air-conditioned VIP Lounge and had an early dinner inside. By the time I was done, an hour later, the match preceding Rafa’s had ended. I finished up and walked outside only to find a sea of bodies all waiting anxiously to enter the stadium. I hopped in among the crowd and found a way to manoeuvre myself to the front of the crowd and then they opened the gates! Words can’t begin to describe my elation. The stadium was packed! It felt like nearly everyone in attendance was a Rafa stan. Every now and again you’d hear a distinct French-accented fan yell ‘Allez Benoit’ but there was a lot of ‘Vamos Rafa’ to be heard as well. It was a marvellous experience, attending a tennis match and seeing one of my favourite players live. I will forever cherish the memory of this day and I impatiently look forward to the next Rogers Cup. Congratulations Rafael Nadal on winning your fourth Rogers Cup title!